American troops who died while based in Berkshire during World War II will be commemorated with a new memorial. Greenham Common was a major US airforce base, where thousands of US troops were stationed in the run-up to D-Day. There is already a memorial at the site to the 33 victims of a glider crash at Greenham on 12 December 1944. Three days later 16 men died when two B17 Flying Fortress planes collided near the base. The new memorial will honour all who died while based there. Military operations ceased at the site in 1992 and it is now a nature reserve and business park. 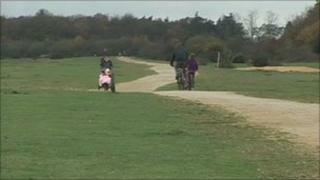 The Greenham Common Trust has contributed funds and is providing a piece of land on the park for the new memorial. It is being erected by the Newbury branch of the Royal British Legion which is in the process of raising £25,000 to pay for it. Keith Williams, of Royal British Legion, said: "These young men died tragically, many miles from their homes and families. "It is our honour to remember the sacrifice they made in the defence of freedom." The original glider memorial plaque will be transferred to the new site. Greenham Common also housed nuclear weapons, which famously sparked protests in the 1980s. The women of Greenham Common who camped outside the base to protest against the deployment of cruise missiles carried on a vigil for 19 years, continuing even after the missiles left.